Author-signed copy Special Offer £5-95 + P&P. For a single P&P charge of just £2-95 per order, books are sent by First Class post in the UK and by Air Mail to other countries. Use your Credit Card, Debit Card or PayPal Account via our secure on-line payment system. 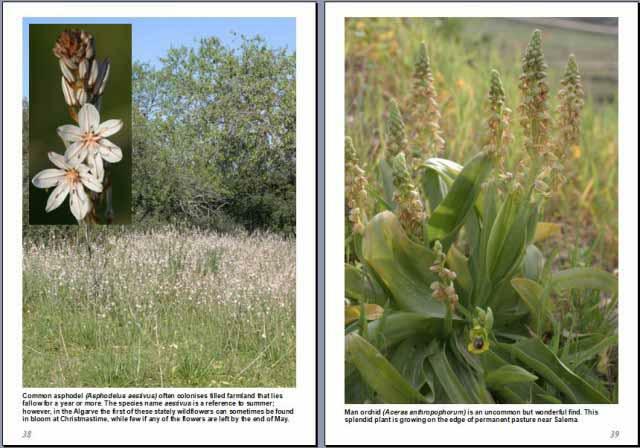 More than 100 large colour photographs and descriptions of the Algarve's varied wildflower habitats and plant species; 'where and when to look' advice; details of the Algarve's nature reserves and natural parks. All pages are lavishly illustrated. In-situ and in addition where appropriate closeup photographs complement the descriptions to help with the identification of wildflower species. Who Cares for the Algarve Environment? This user-friendly information source will delight newcomers to the Algarve as well as residents who want to discover more of the hidden botanical gems of the region. Well-known authors and naturalists Pat O'Reilly and Sue Parker have produced a beautifully illustrated introductory guide to the wildflower delights of the Algarve. With chapters on the major habitat types - coastal cliffs and coves, agricultural land, river valleys and estuaries, and mountains and forests - the authors guide visitors to the best wildflower locations, describing and illustrating more than 100 of the most beautiful wildflower species to be found throughout the year. Writer and broadcaster Pat O'Reilly has wandered the countryside throughout Europe in search of wildflowers for more than 50 years; he has written more than 20 books mainly on wildlife and countryside topics. Sue Parker is a frequent contributor to countryside magazines, radio and TV programmes and has been photographing wild orchids for more than 30 years; Sue has written ten books to date. This book uses the commonly accepted term wildflowers, rather than wild flowers. Whatever your preference the flowers illustrated and described in this guide book are some of the most beautiful to be found in the Algarve, southern Portugal.